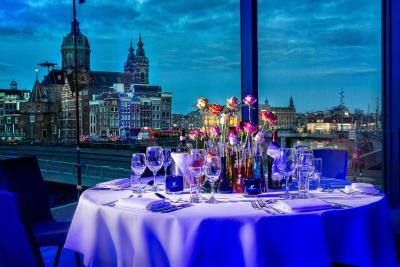 Lock in a great price for DoubleTree by Hilton Amsterdam Centraal Station - rated 8.3 by recent guests. Some of the staff were really pleasant and helpful. 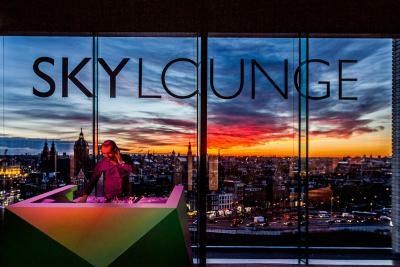 The location is fantastic & the view from the Sky Lounge is amazing. 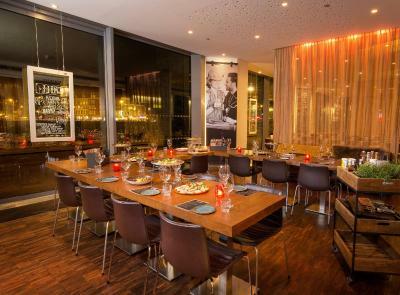 Central location near Centraal station and local attractions. Very comfy beds and great air con, I get very hot this was perfect. 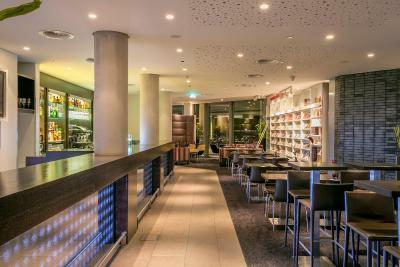 The location is perfect next to the station and a very short stroll into the centre. 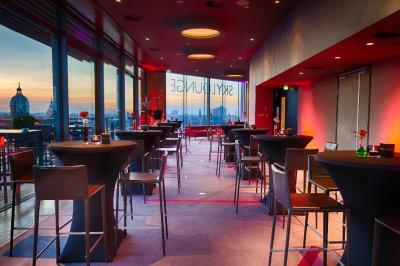 Food was good and the Sky Bar is a good place to start the evening. 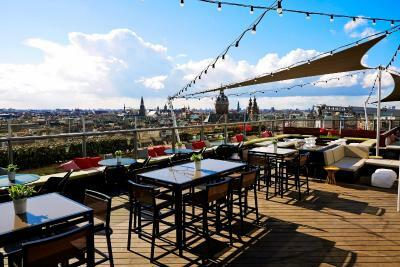 The only good things in this hotel are the rooftop bar and the breakfast buffet. 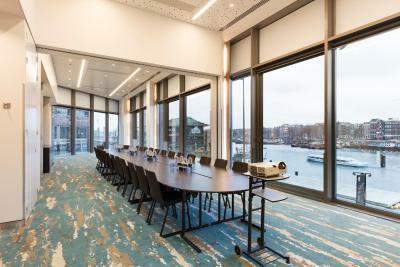 One of our top picks in Amsterdam.DoubleTree by Hilton Amsterdam Centraal Station combines elegant modern rooms, business facilities with the latest A/V technology, a fitness centre and an ideal location overlooking the River IJ and city centre. 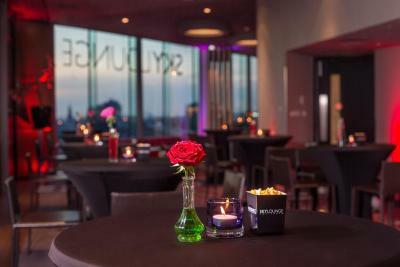 It is next to Amsterdam Central Railway Station and features the SkyLounge Amsterdam with scenic city views. 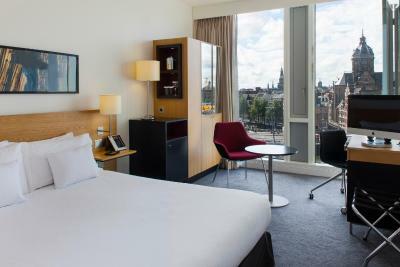 All of the guest rooms at DoubleTree by Hilton Amsterdam Centraal Station feature floor-to-ceiling windows, an Apple iMac PC/TV and complimentary WiFi. The Executive Rooms and Suites come with 24-hour access to the ground floor Executive Lounge that offers complimentary breakfast in the morning, and drinks, fruits and snacks in the afternoon. 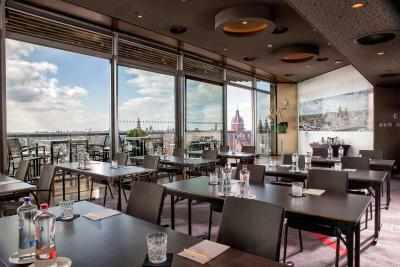 DoubleTree by Hilton Amsterdam Centraal Station includes a high-tech gym and many open-air spaces including a courtyard. 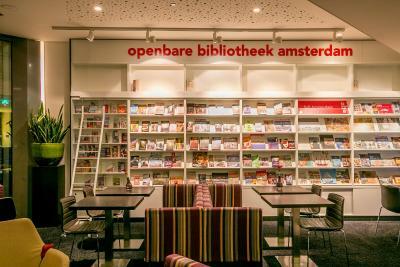 A wide selection of books and magazines are available for a good read. 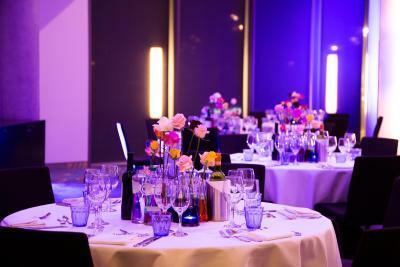 Choose from a wide range of international dishes and local flavours at one of the three dining options within the hotel. 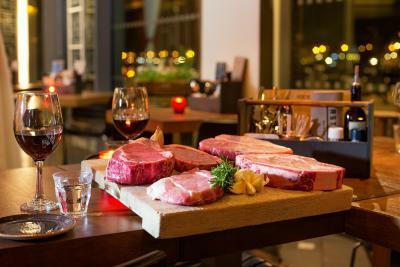 The light breakfast and lunch restaurant is transformed daily into the intimate Eastwood Beer & Grill for guests to enjoy dinner. 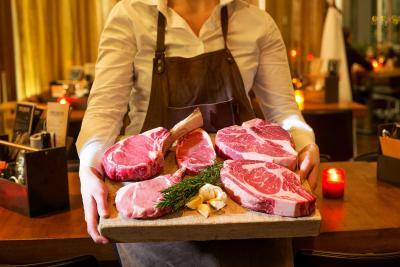 Grilled on the broiler, they serve meat, fish and vegetarian dishes. 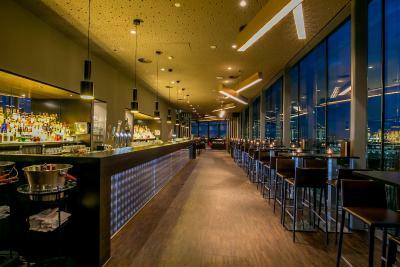 Enjoy a snack or a light meal at the Lobby Bar, then head over to SkyLounge Amsterdam on the 11th floor. 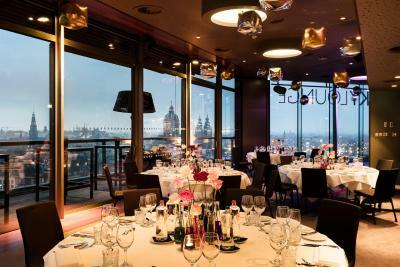 In the evening the rooftop bar and terrace offer drinks and meals as well as cosmopolitan vibes from a DJ. Tram and metro connections are available less than a 2-minute walk away. 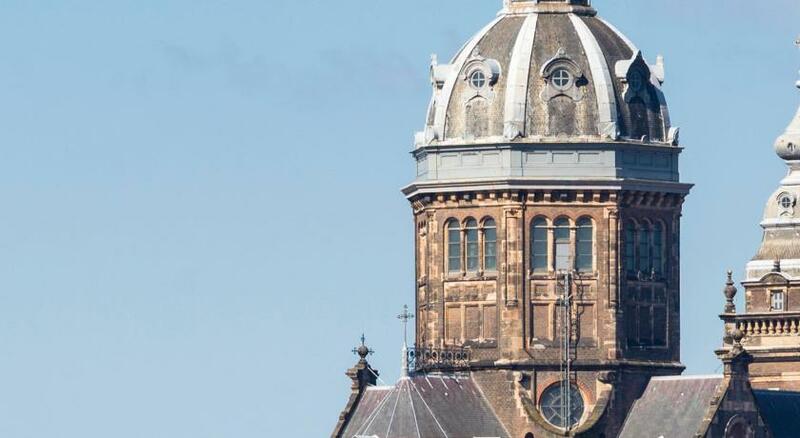 Dam Square is a 5-minute walk from the hotel. 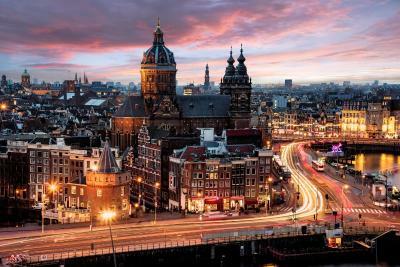 Amsterdam Schiphol Airport is 20 minutes away by train or car. 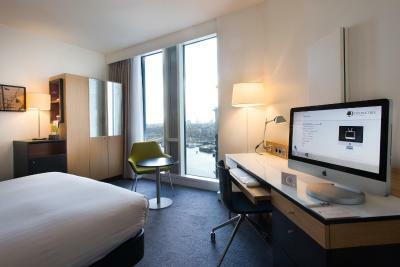 DoubleTree by Hilton Amsterdam Centraal Station has been welcoming Booking.com guests since 4 Mar 2011. 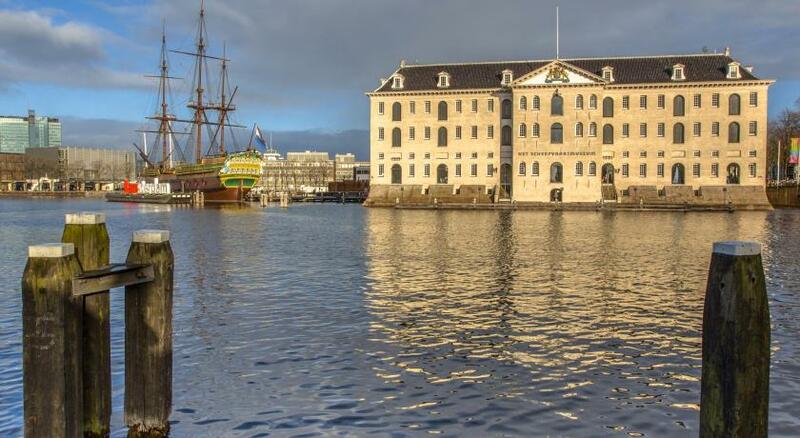 When would you like to stay at DoubleTree by Hilton Amsterdam Centraal Station? Specially designed for guests who require additional space and amenities, these rooms feature complimentary WiFi, a spacious desk with ergonomic chair by Mirra®, extra wide doorways, doorbells with audio and strobe alerts. The bathroom has a roll-in shower, handrails and adapted washbasin. There is also an Apple iMac PC/TV and a mini refrigerator available. This modern room with river, courtyard or dock view features a spacious layout, a mini refrigerator and a spacious work desk with ergonomic Mirra chair®. The room also has an Apple iMac PC/TV and complimentary WiFi. 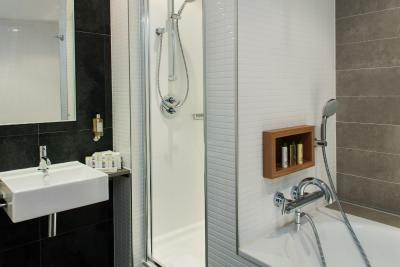 The bathroom comes with a walk-in shower and luxurious Crabtree & Evelyn ® bathroom amenities. 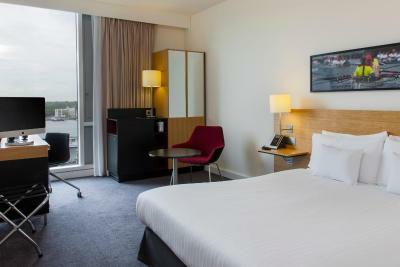 This contemporary Executive Room overlooks the historic city centre and comes with complimentary breakfast, a complimentary morning newspaper upon request and late afternoon drinks, fruits and bites in the Executive Lounge. This room features a Queen size bed, complimentary WiFi and an Apple iMac PC/TV. The elegant bathroom is fitted with a walk-in shower and luxurious bathroom amenities by Crabtree & Evelyn ®. 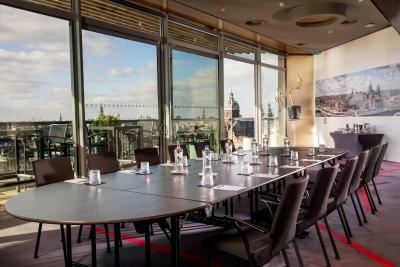 This Executive Queen Room comes with Executive Lounge access, a balcony and floor-to-ceiling windows with city view. The bathroom is fitted with a walk-in shower. Complimentary WiFi, a mini refrigerator, a safe and Apple iMac PC/TV are also available. 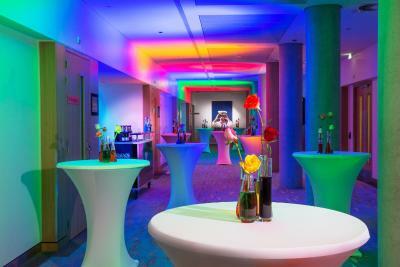 The Executive Lounge access comes with complimentary breakfast, as well as drinks, fruits and bites. This room comes with two single beds and floor-to-ceiling windows. It features a river, courtyard or dock view. For your entertainment, the room has an Apple iMac PC/TV with complimentary WiFi, a safe, luxury bathroom amenities by Crabtree & Evelyn ® and a mini refrigerator available. A spacious and stylish air conditioned suite with a separate living room featuring flat-screen TV, an Apple iMac and a mini refrigerator. The modern bathroom has a walk-in power shower, mist-free mirror and luxury amenities by Crabtree & Evelyn ®. The bathroom provides dressing gowns and slippers. 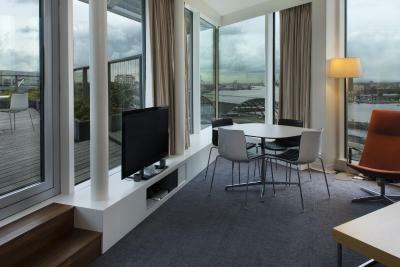 This King City Suite features a city or harbour view. 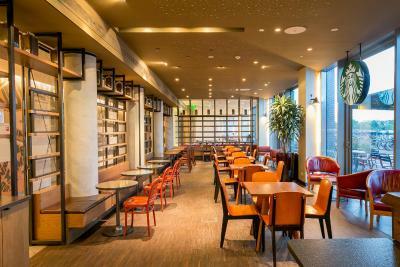 The Executive Lounge access comes with complimentary breakfast, as well as drinks, fruits and bites and free morning newspaper upon request. Junior Suites with courtyard or city view feature extra spacious living areas, complimentary breakfast and a free morning newspaper upon request. Each fully-equipped junior suite comes with an Apple iMac PC/TV, a mini refrigerator, complimentary WiFi, individually controlled air conditioning and floor-to-ceiling windows. The modern bathroom is fitted with a walk-in power shower, mist-free mirror and luxury bathroom amenities by Crabtree & Evelyn ®. It also provides dressing gowns and slippers. The Executive Lounge access comes with complimentary breakfast, as well as drinks, fruits and bites. This bright air-conditioned room features a king size bed, a spacious layout, a mini refrigerator and floor-to-ceiling windows. This room offers partial views river, courtyard or dock, an Apple iMac PC/TV, a safe, a working desk with an ergonomic Mirra® chair, and free WiFi. The King Master Suite with city and harbour view features an extra spacious living area. Each fully-equipped suite comes with an Apple iMac PC/TV, a mini refrigerator, complimentary WiFi, individually controlled air conditioning and floor-to-ceiling windows. The modern bathroom is fitted with a walk-in power shower, bath tub, mist-free mirror and luxury bathroom amenities by Crabtree & Evelyn ®. It also provides dressing gowns and slippers. 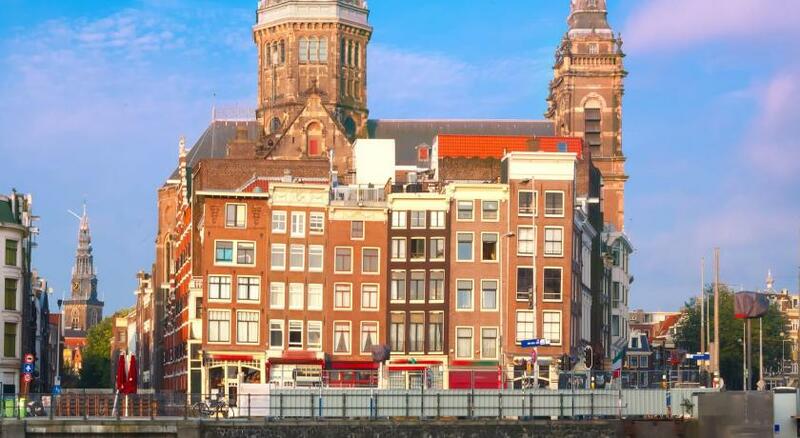 Hotel surroundings – This neighbourhood is a great choice for travellers interested in nightlife, architecture and walking – Check location Excellent location - show map Guests loved walking around the neighbourhood! 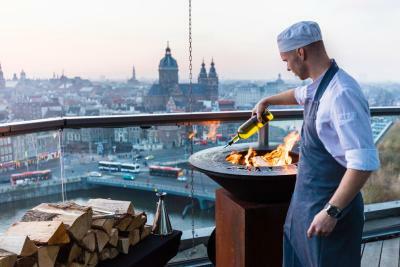 House rules DoubleTree by Hilton Amsterdam Centraal Station takes special requests - add in the next step! 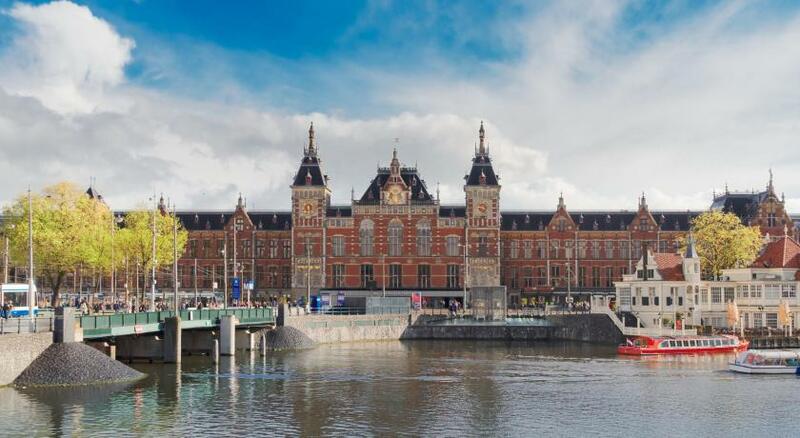 ATM card DoubleTree by Hilton Amsterdam Centraal Station accepts these cards and reserves the right to temporarily hold an amount prior to arrival. 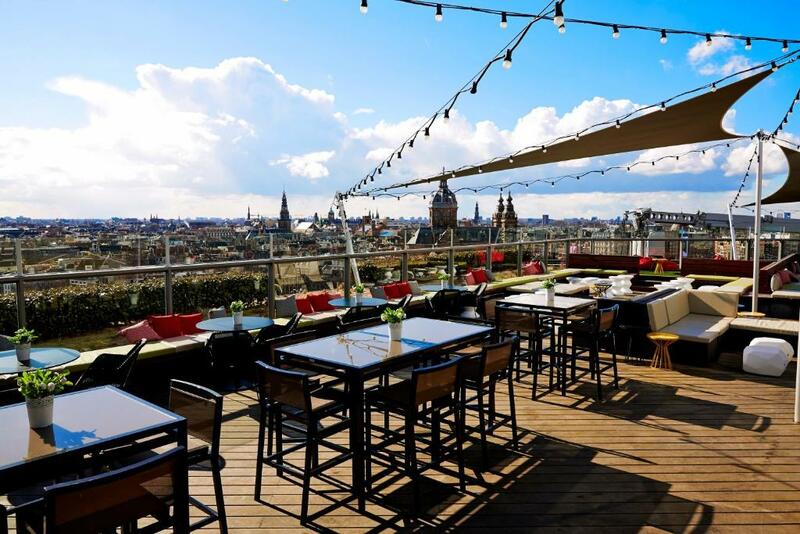 DoubleTree by Hilton Amsterdam Centraal Station accepts these cards and reserves the right to temporarily hold an amount prior to arrival. 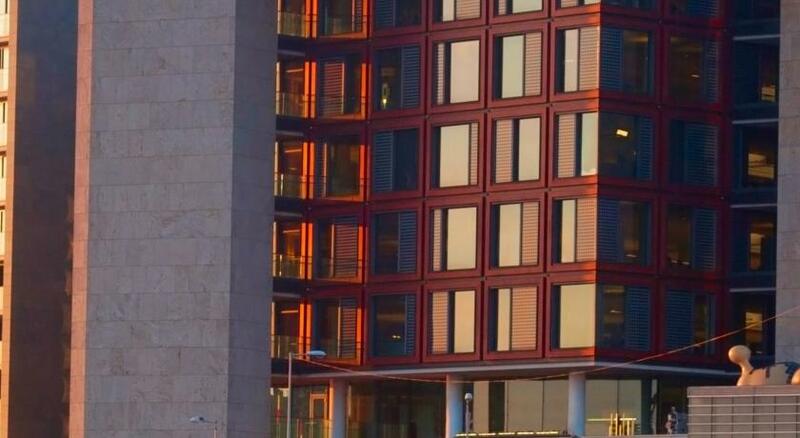 Please note a security deposit is required of 50 EUR per day. I had requested courtyard access & emailed the week of my stay and called prior to arriving and was told that my room had been reserved, however upon arrival I was unable to obtain the room I had requested and was placed in a room as far away from the lifts as possible - I was moved the next day to a room on the same level as the courtyard exit but was disappointed to find that yet again I was not supplied courtyard access and was placed some distance away from the courtyard door and lifts. 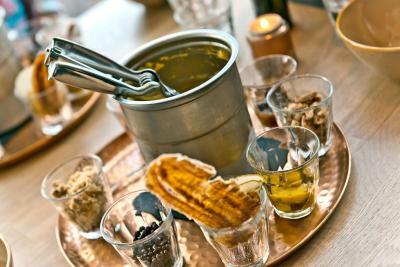 Some of the staff were unhelpful or got our orders wrong when ordering drinks & food (not once but twice for the same order). Sometimes our order did not arrive at all. The room cleaning does not match very well, I stepped away from 9:30AM till 2:30PM, room is untouch and have to contact from desk for the cleaning. Same thing happen on 2nd day, so have to contact the front desk to get it done. Beds were a bit hard for me but my preference is a bed on the softer side. Location was perfect and staff was knowledgeable and welcoming! The first morning we were there we had coffee in our room. Some spilled onto the table and the stain remained there for our entire stay. My friend took a bath and could not drain the tub afterwards. The hairdryer overheated so I had to stop and let it cool off. I thought it was a bit expensive. I would have preferred a room with two queen beds to he king we had. Loved the chocolate eggs that were put out at reception and elsewhere. The location was perfect for us. 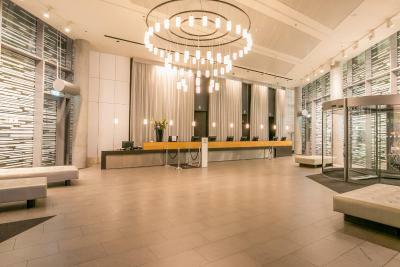 The staff was wonderful; Aleksander at the concierge was especially helpful. We were pleased to be upgraded to a suite. Breakfast had wide array of choices. Room was spacious. Very lousy check in. Very very bad cleaning seevice. @ 5 pm the rooms where cleaned.hurry hurry. And i had to ask gor another matrass. The matrass on my bed was very "lived in"
The room especially booked by me with two separate (!!!) beds in fact was the room with two beds with maximum 10-15 cm between them. The senior staff was trying to convince me that it means two separate beds explaining that in their own home they would also consider it like two separate beds and they are not able to help me and to correct the situation. When I asked for the name of the senior manager she gave me her first name refusing to provide the last name and clarifying that she does not give it for other people. No way to come back. I have booked and paid my room 3 weeks in advance. I have received a disabled person room whitout notice - the problem is not that the room was designed for disabled, the problem is that the room was looking horrible: black marks on the walls, old furniture, computer 19 inch used as a tv and placed in a corner of the room, bathroom sas a mess - old interior and broken handle, drier on a messy bag. More than that, room above the railroad - again without any metion about that. I complained about that and they said that was the last room - again I mention 3 weeks ago. Going out for the launch their were checking in 10 persons. Never again, never recommend! Room is spacious and clean. Good location and easy to access everything. 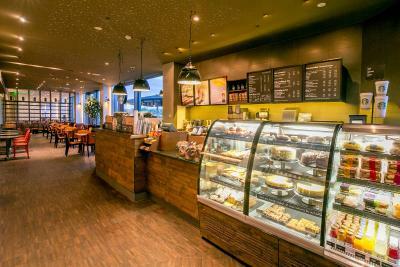 There is starbuck coffee and large supermarket nearby.